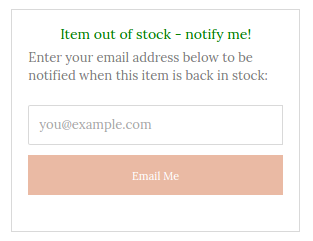 The following CSS classes and id's can be used to add customised styling to the Now Back in Stock popup. This is the container of the whole popup. This is the container of the SMS input elements. This is the container of the SMS country select dropdown. This is the class of text when the SMS notification an alert is set up. This is the container of the email input. This is the class of text when the email notification an alert is set up. This class is used for error messages when customers fail to add an alert successfully. This class is used for messages when customers an alert successfully.